Item number 3123/74 from the MOA: University of British Columbia. Aluminum (?) weight for measuring gold. 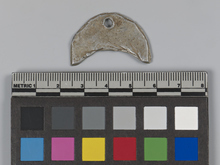 Object is a wide crescent shape, very thin, with a bored hole along the convex edge. Edges are roughly cut. Asante ? or Akan ?